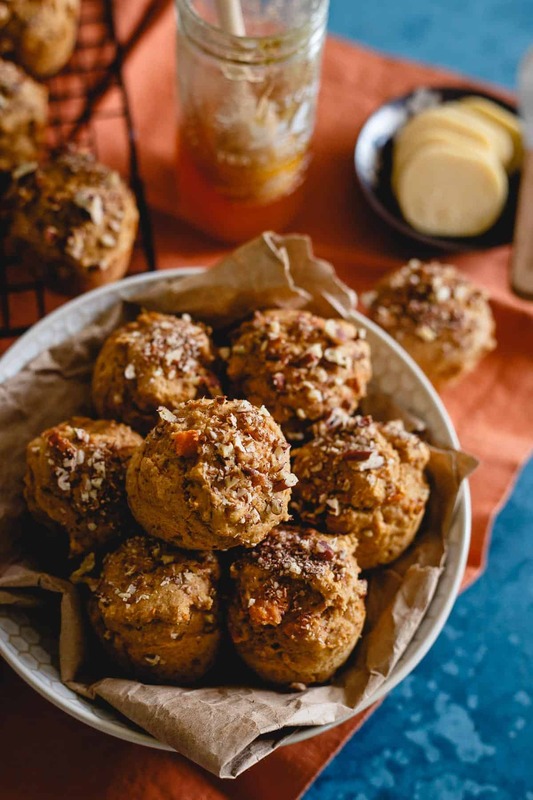 These whole wheat sweet potato banana muffins are perfect for breakfast or as a healthy snack. 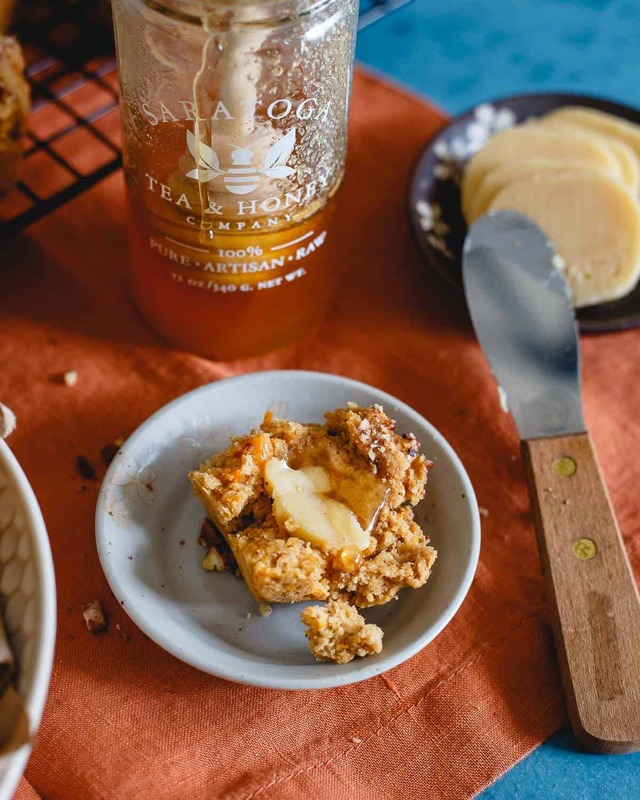 Smear with butter or drizzle with some quality honey. Best served warm! Sometimes the stuff you see on here is a result of creativity on my part, inspiration from other amazing resources or just intense cravings. This is not one of those times. These muffins had one sole purpose and that was to get rid of a can of sweet potato puree that had been sitting in my pantry for about 2 years, expired by 5 months. Obviously, I pay very close attention to expiration dates. I actually find muffins kind of difficult to get right on the first shot, so I was pretty surprised when these ended up turning out exactly how I had envisioned them. Mostly savory, no intense banana flavor (I just wanted to use it for natural sweetness rather than sugar), perfect with butter, but just as good with soup or chili. These are not something that will fix a sweet tooth (at all) but that’s ok because there are way better things in life (like TJ’s dark chocolate cookie butter bars…o.m to the g) than muffins for sweet tooth episodes anyway. So far, they’ve been enjoyed for breakfast, as a side at dinner and as a pretty healthy mid-day snack. Sometimes expired food is a good thing. 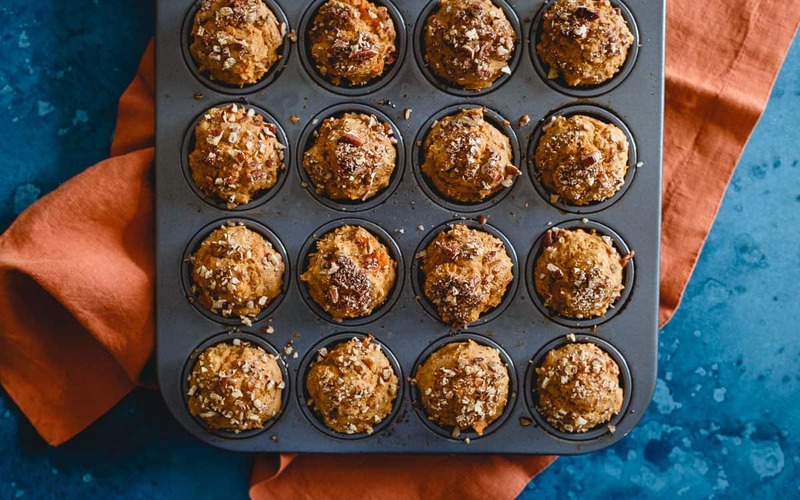 These whole wheat sweet potato banana muffins are perfect for breakfast or as a healthy snack. 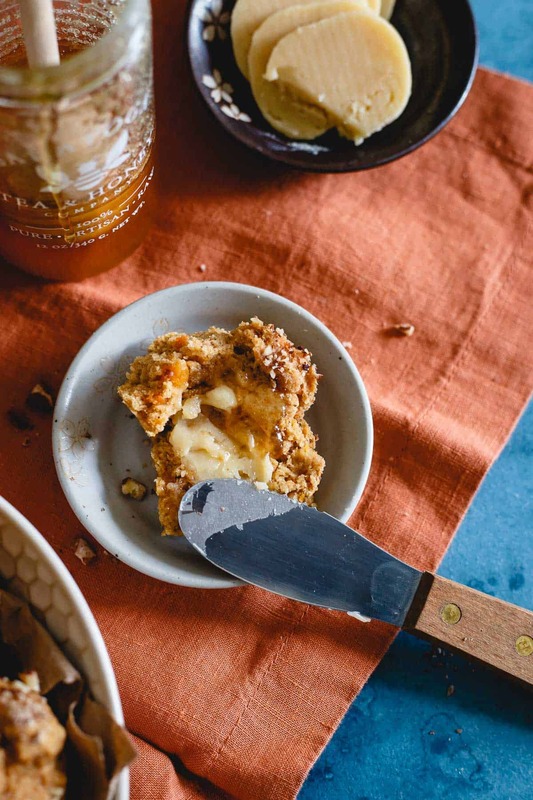 Smear with butter or drizzle with good honey. In a large bowl combine the flour, baking powder, baking soda, spices and salt. In another large bowl, combine all the coconut sugar, maple syrup, coconut oil, egg, sweet potato, banana and milk. Whisk until batter is somewhat smooth and thoroughly combined. Pour wet ingredients into the bowl with the dry ingredients and mix with a spatula until well combined. Scoop batter in spoonfuls into the greased muffin tins. Top with chopped pecans if using. Bake for about 10 minutes until muffins are risen and the tops and sides are just starting to turn golden brown. Remove from oven, let sit in muffin tin for 5 minutes before transferring to a cooling rack. This recipe will make about 10-12 regular sized muffins if you don't have a mini-muffin tin. Follow the same instructions, just bake for an additional 10 minutes (20 minutes total). Those look amazing – I don’t like sweet thangs (ha!) so these are perfect for me. I just might make a batch to go with the soup I’m making tomorrow! I’m making these! U have a can of sweet potato puree in my cupboard to and I didn’t know what to do with them, now I am going to make these muffins. I love the idea of sweet potato and banana together! This is going to be good!! I have seen so many recipes with sweet potatoes in them I don’t know why I haven’t tried it out yet! These look great! I agree– muffins can be hard to get right! Yours look perfect though! sound awesome, I agree muffin baking is quite tricky as far as texture. Too dry and it’s all over, too crumbly and they are just annoying. 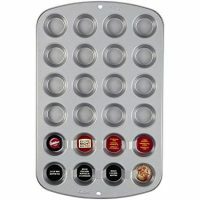 These would be great to serve with chilli on the superbowl in fact! Those look so good! I’m a sucker for treats like those because like you said, they’re so versatile. I love heating muffins like that up in the oven and spreading a little butter and jam – ahhhhh. I love muffins that are practically sugarless. If the sweetness comes from fruit, that’s my kind of delicious. Ooops in hit submit before I was done talking. These look great! I everything on hand to make these except for pastry flour, so I’ll just use regular whole wheat. I cringe when baked goods have cups upon cups of sugar so I’m always on a mission to reduce it! Just an fyi, regular whole wheat will definitely change the texture of these. If you have regular AP flour, I’d consider mixing it half and half at least. Not sure how they’d come out with 2.5 cups of regular whole wheat. Looks like an awesome recipe! I love when experimental recipes turn out exactly how you envision. Unlike some cookies I made this week that may have turned out rather salt-lick like. Apparently you can’t take a well salted cookie and a well salted butterscotch and put them together without making the final product taste salty. Weird. In my defense, both parts tasted fabulous separately. Pinned, saved, and can’t wait to make! I love muffins! and sweet potatoes….and bananas! c’mon now, this recipe is just great! I really find your blog very interesting… Healthy muffins are delightful for kids and for moms too. Thanks for sharing! These were sooo good! I ate them all before Mike had a chance to try one. I bet they would be delicious with some chocolate :) Glad you liked them! I just made these with some leftover sweet potatoes and I must say they are delicious! I added some mini cinnamon chips that had just arrived from King Arthur Flour as extra incentive for my kids and because I have a super sweet tooth and its a great flavor pairing.t I think they would still be wonderful without the cinnamon chips. Just curious – I have these in the oven now, but had to add some liquid to make the batter mixable. Does this recipe really use just 1/2 C milk? Seriously, these sound so incredible! I have yet to make a sweet potato muffin, but now I have to! So glad you brought these back Gina! They sound amazing. I have not tried sweet potato muffins but I’m anxious to give them a go! 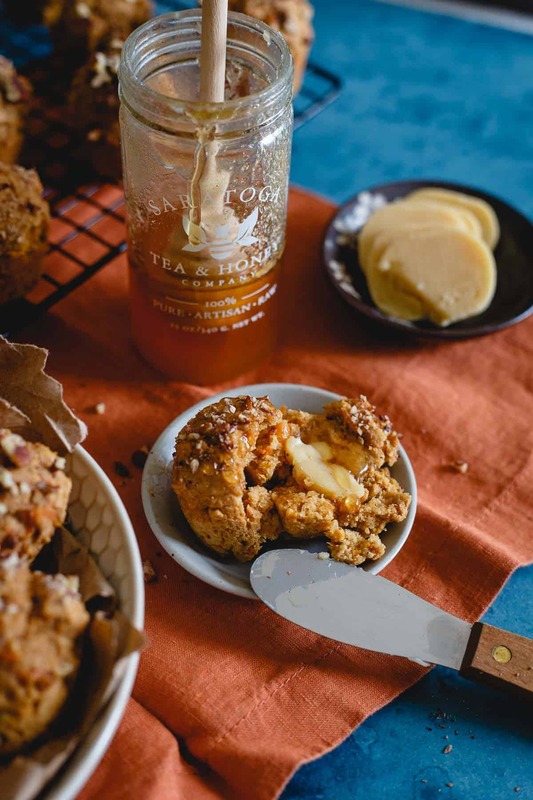 OK these are so cute, and omg you are using Saratoga Honey! My sister went to school there, and we LOVE their products and packaging! We went upstate for our anniversary in the fall and found the shop. I’m literally OBSESSED with this honey and I normally don’t even love honey by itself. I want ALL the flavors now. What a lovely, lovely muffin. I’ve convinced our girls on the goodness of sweet potatoes over the past year, need to try this recipe on them! I added some applesauce to make the mix less thick (but still healthy!) and added some dark chocolate chips…because I have a sweet tooth :) They are delicious — thank you!! Yum! Glad you liked them :) was just contemplating making a batch to have for the week myself!